Found another cool moms' gathering spot on the Web: CafeMom. I've started a MomsRising group there for anyone who wants to chat about MomsRising issues. Can't wait to see you there! 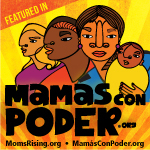 Check out MomsRising at CafeMom!